Dogs had been trained for military purposes by both sides during World War I. Once the war was over, the practice was temporarily abandoned. On March 13, 1942, the Quartermaster Corps of the U.S. Army once again began training dogs for the now official War Dog Program called the K-9 Corps. Over a million dogs took part in the war effort during WWI. One of the most celebrated of them was Rin Tin Tin, an abandoned German Shepherd puppy found in France and brought to the U.S. He achieved fame and fortune as a silent movie star, and popularized the then little known German Shepherd breed throughout the United States. Once the war was over, the canines of America went back to fetching slippers and chasing cats – until the Japanese attacked Pearl Harbor. On March 13, 1942 the Secretary of War Robert P. Patterson authorized the Army to begin inducting dogs to aid the war effort. Initially, thirty breeds were accepted for service, but the number was quickly whittled down to seven: German Shepherds, Siberian Huskies, Doberman Pinschers, Belgian Sheep Dogs, Giant Schnauzers, Farm Collies and Eskimo dogs. A K-9 Training Center was established in late 1942 at Fort Robinson, Nebraska where thousands of dogs were trained for duty. 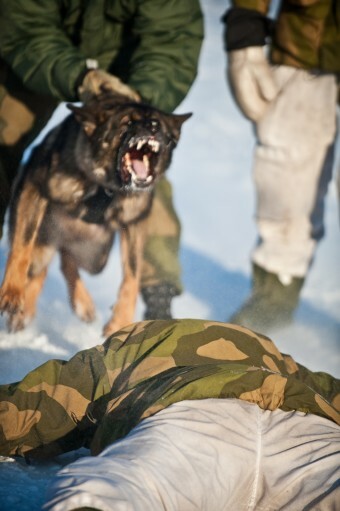 Once obedience training was completed, members of the K-9 Corps began one of four programs to prepare them to work as sentry, messenger, scout or patrol, or mine detection dogs. Scout dogs proved the most useful in combat situations, preventing surprise attacks by alerting troops to an approaching enemy. Training generally took between 8-12 weeks. The stand-out canine war hero of WWII was Chips, an intrepid German Shepherd trained as an infantry dog who served with the 3rd Infantry Division. After breaking loose from his handlers, Chip located and attacked an enemy machine gun nest, forcing their surrender to allied forces. The wounded war dog was initially awarded the Silver Star, the Purple Heart and the Distinguished Service Cross – all of which were later taken away because the Army forbade the issuing of these honors to animals. In fact, the war dogs who served so faithfully were not always treated well. For instance, over 20,000 family dogs sent off to the Army when the K-9 Corps was first forming were killed for being “too old” (over five) or otherwise found to be “unfit for duty”. Veteran K-9 dogs were also often killed by the Army until very recently. They reasoned that the animals would not be able to adjust to civilian life. When the Vietnam war ended, combat dogs were left behind as “surplus military equipment” when U.S. troops pulled out. This was also traumatic for their human K-9 Corps trainers and handlers, who worked with these faithful animals on a daily basis, saving lives and risking their own. Like-minded veterans soon joined together to protect and honor American service dogs. Thanks to pressure from veterans and animal lovers, the United States now accords war dogs many of the same honors and privileges as full members of the military.